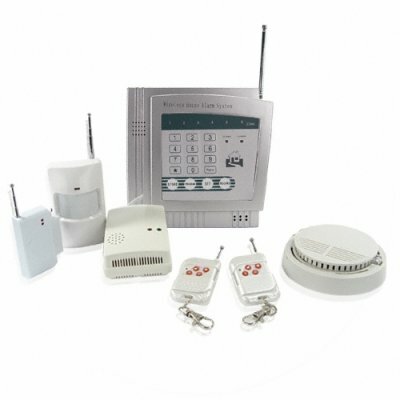 Successfully Added Superior Wireless Home And Office Alarm System to your Shopping Cart. Protect your home or office with this wireless control, remote dialing home or office alarm system. Versatile programming allows you to program up to 4 four alarm zones (garage, back door, bedroom, etc.). For added protection you can program up to 6 different telephone numbers the system will automatically dial (including police and fire brigade if you choose) when the alarm is set off and it includes a telephone wire for easy connection to your telephone land line or home or office computer. When this system calls a number in an emergency it will play a 10 second message that you record. Full control of the alarm system can be gained by calling the phone line that the alarm system is hooked up to. The alarm horn is housed inside the control box for convenience. This superior edition also includes a smoke detector and gas sensor that join your security network for the best protection available, perfect to for the protection of your whole family not just your belongings. Get a good nights sleep with Chinavasion's no M.O.Q. policy and direct shipping right to your door, securely order yours online today. on 2009-01-17 04:35:47 A good security device. other device(s) would i need to enable me use my Superior Wireless Home and Office Alarm System.